THE QUILTED PINEAPPLE: All Aboard, The Christmas Gift Express! I've been planning on making a few gifts this year as presents, but I am w-a-y behind schedule. I'm now on The Christmas Gift Express riding full steam ahead!! I can't believe how fast Christmas is approaching and I have so much left to do. One of the projects I'm planning on making this weekend is a little wool candle mat from none other than Primitive Gatherings. I made this one last year. It's so cute and super fast and easy to make! I think it only took a few hours to make from start to finish. It makes for a great gift. The one I am making this weekend will be a gift, but I can't say who it's for because they might read this. I'm a complete Lisa Bongean and Primitive Gatherings groupie. I've never met a project I didn't like from there! Last Saturday was their annual Christmas Open House. I've never been, but all the specials they have for the day apply to online customers too. Lisa rewards her customers in a big way. If you shopped that weekend, you got 3 FREE wool patterns (one was a kit for a pin cushion) AND a coupon book to use for the next year. So of course, I did some shopping. I purchased items to make as presents, a project for the girls and I to do and a project to do once my "Hop To It" is complete on Wednesday nights. My package arrived yesterday and it was like Christmas morning! Oh yes! It was a wool wonderland here yesterday! I opened each package to admire all the beautiful wool! Hopefully, I can get my gifts done before Christmas! I have to work all weekend, so I'll be trying to get as much done in the few spare moments I have. I hope everyone has a wonderful weekend. That mat is ADORABLE!!! I think it is time I get my wool out this weekend and play. OMG! I love your pile of goodies. Christmas is early at your house. Looks like some nice goodies to work with. I need to get better, so I can get out and shop, going nuts, lol. Love that snowman mat - it's adorable. Love the snowman mat! 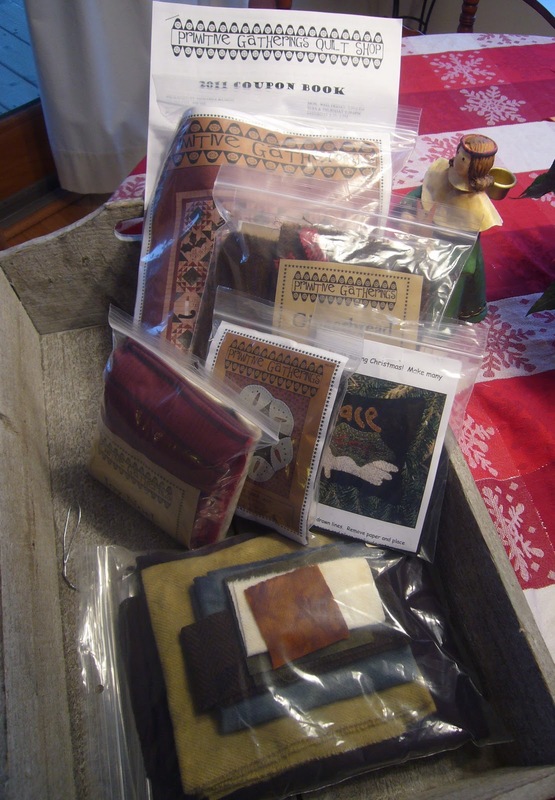 Oh what a wonderful package...I meant to do that Saturday...I want that kit for the Christmas quilt...love it! OH, you lucky girl. I love everything they have too. We have snowman on our minds. lol thanks for stopping by my blog. had the 'goodies' that Primitive Gatherings has. Oh that is sooo cute! I love snowmen of any type!! Those projects are sure to be a lot of fun! 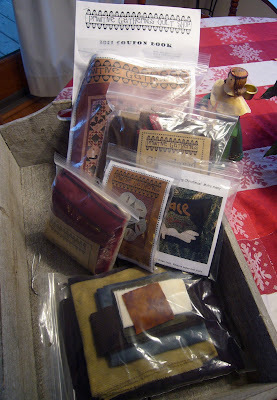 I've got to buckle down and work on my Christmas projects this weekend; I am so behind. I adore the snowman candlemat!! And a wooly wonderland for sure at your house!! So many goodies! I can't wait to see them all made up. Ooohhhh there is nothing like a Primitive Gathering spree! Nothing beats it... NOTHING! Oh gosh...anything Primitive Gatherings is a win win!! You won big! Okay...well you shopped big with huge success of scoring some lovelies!! Woolie goodness looks very interesting. I have yet to finish a wool project even though I've started several! I Love PG too!! I am up here in Canada drooling like crazy!! I read all about Lisa's sale...lucky you!! Thanks for sharing...your pennies are wonderful! !